It is similar to Jasmine and Evergreen, but does not attempt to be framework agnostic. 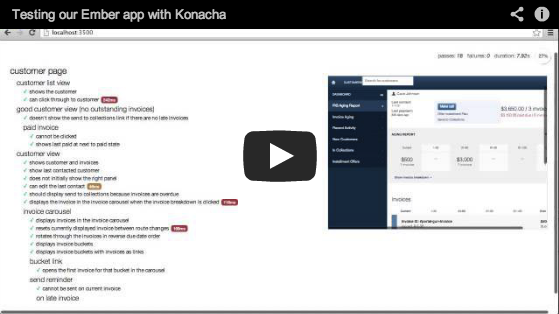 By sticking with Rails, Konacha can take full advantage of features such as the asset pipeline and engines. Your tests are run inside an iframe. You have the entire <body> element to yourself, and it is automatically reset between tests. Then open http://localhost:3500 in your browser, and you will see all your tests running. You can also go to a sub-page to run an individual spec file (e.g. http://localhost:3500/array_sum_spec), or a path to a subdirectory to run a subset of specs (e.g. http://localhost:3500/models). This is the recommended mode for development, since you can simply hit refresh to reload all your test and asset files. To debug tests, use the debugger statement anywhere in a test to halt execution. To run individual specs, pass a comma separated list of spec file names via the SPEC environment variable. Konacha includes a default formatter modeled upon RSpec's ProgressFormatter. Additionally, Konacha's runner implements the same protocol as RSpec, so many RSpec formatters also work with Konacha. You will need to require any formatters you use. It's a good idea to do this within a defined? check in your Konacha initializer. To automatically trigger reruns when files change, try guard-konacha. // Show stack trace on failing assertion. We suggest that you explicitly require just the assets necessary for each spec. Konacha runs each spec file in isolation, and requiring things explicitly will help ensure your scripts don't accumulate hidden dependencies and tight coupling. However, you are free to ignore this advice and require the entire application.js asset bundle in your specs or spec helper, or a bundled subset of assets. Requiring bundled assets works like it does in Rails development mode -- Konacha will detect the complete set of dependencies and generate a separate script tag for each one. You won't have to search through a many thousand line application.js bundle to debug a spec failure. The defined? check is necessary to avoid a dependency on Konacha in the production environment. Konacha includes a vendored copy of mocha.js and the chai assertion libraries. By default, it configures Mocha to use the "BDD" test interface, which provides describe(), it(), before(), after(), beforeEach(), and afterEach(). Konacha will make all three of chai's assertion styles available to you: expect, should, and assert. See the chai documentation for the details. The following example uses EJS. You can use an alternative templating language, like ECO, but you need to add something to your Gemfile in order for Sprokets to define the JST function and make your templates available. The only backward-incompatible change in Konacha 4.0 is that Rails versions less than 4.1 are longer supported. Please upgrade to 4.1 or later. Run bundle exec rake to run the test suite. Assuming your app's Gemfile points at your Konacha checkout (gem 'konacha', :path => '~/path/to/konacha'), your changes to Mocha and Chai are live in localhost:3500 when you refresh your browser. You can send pull requests to Mocha and Chai straight out of your submodules. Generated on Thu Apr 18 12:48:33 2019 by yard 0.9.19 (ruby-2.5.1).